The Consortium was incorporated as a non-profit organization in Evansville, Indiana, in Fall 1985 as the Consortium for Computing in Small Colleges under the direction of Will Mitchell, who along with Wally Roth and Christine Shannon formed the Board of Incorporation. Its purpose was to publish articles and papers related to computing from small institutions. The first issue of the Journal of Computing in Small Colleges was mimeographed and distributed to over 200 faculty in October 1985. It contained 32 pages and five papers. The first CCSC conference was held in what is now the Southeastern region in Fall 1987, modeled after the Eastern Small College Computing Conference (ESCCC) which had begun in 1985. New regions and conferences were organized as attendees moved to other regions or wanted to organize a conference closer to their institutions. The South Central conference began in Spring 1990, and the Rocky Mountain conference followed in Fall 1992. Instead of waiting for regions to form, Will Mitchell began to invite participants to form regions. The first Midwest conference was held in Fall 1994 and the Central Plains conference began in Spring 1996. Despite the concerns of the ESCCC, the Northeastern region was formed, and its first conference was held in 1996. The first Northwestern conference was in Fall 1999. The ESCCC eventually joined the Consortium as the Eastern region in 2001. In 2002, in recognition that small programs in larger schools have similar issues as programs in small schools, the organization name was changed to the Consortium for Computing Sciences in Colleges (retaining the CCSC moniker). After some tension regarding how new regions are formed, the Midsouth region was accepted into the Consortium in 2005 after several successful conferences. The tenth region, the Southwestern region, was formed in 2008. The Journal of Computing Sciences in Colleges currently is published as six issues per year containing over 100 papers presented at the regional conferences. 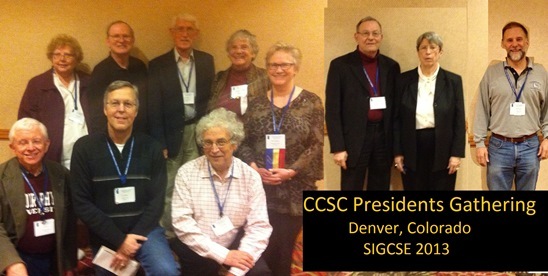 Originally, CCSC Presidents served a three-year period, one year as President-Elect, one year as President, and one year as Past President. In 2006, the term was changed to a four-year period, two years as Vice President/President-Elect and two years as President.